My first anniversary without my husband is coming up and it is also our 25th. It was the anniversary we really looked forward to. We had been making plans for years to take our first vacation alone since our honeymoon, where we planned to renew our vows. 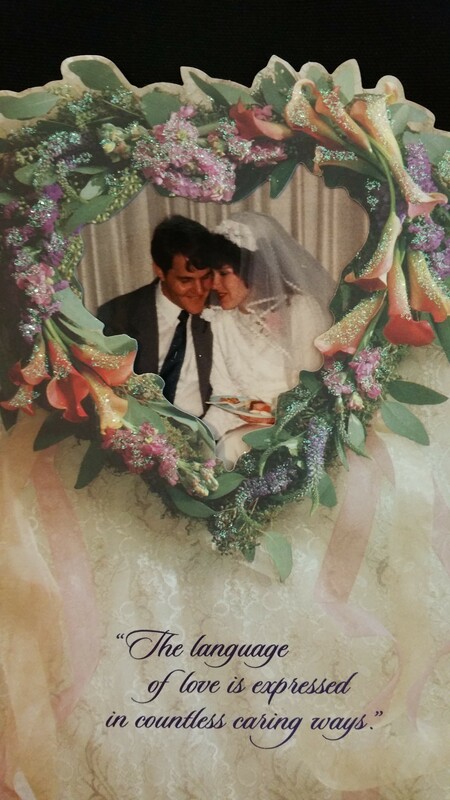 Our special anniversary, 25 years on the 25th of May. Needless to say, this anniversary will be very different from what we planned. Much love to everyone. Gabriele, I’m so sorry. I hope you will be kind to (and patient with) yourself as your anniversary date approaches. Unfulfilled plans and dreams add layers of pain to the loss you’ve already experienced. Before my first anniversary without my husband, a few widowed friends gave me wise advice to schedule flexibility as the date approached. They suggested I plan something I wanted to do for myself while giving myself permission to back out if that’s what I wanted. Pam, I’m so sorry. With your anniversary only a few days away, I’m sure the pain and loss is excruciating. You love your husband; it’s understandable that the intensity of how much you miss him is ratcheted up. I wish I could give you an easy, make-it-better-now answer. For me, the days leading up to my first widowed wedding anniversary were harder than the day itself. I remember feeling lost and alone and bewildered. I do remember the advice other widows and widowers shared with me (which I still follow) for such days. They told me what worked for them was to plan ahead, but with “permission” to cancel plans if that was needed. They urged me to plan an activity or outing I would like (a hobby, a movie, a favorite book or restaurant), something I’d have liked even before my husband died. They suggested I plan to do it with family or friends (or maybe with widowed new acquaintances), letting them know up front that on the day of (or maybe even the hour of), I might want or need to back out. Whatever your anniversary traditions have been in the past, only you will know whether keeping them alone or changing them up (on your own or with others) will lessen the pain of celebrating your wedding day without your husband — and it’s possible you won’t know for yourself which is better for you this year. I know it hurts. As hard as it has been to get through each day so far, your anniversary day may be every bit as difficult — but you’ll get through it. Don’t be afraid to call on friends. Chances are they want to help but don’t know how. You’ll be in my thoughts and prayers. My father-in-law passed away March 31 and this June would have been my in-laws 50th wedding anniversary. I want to acknowledge the day, but I am unsure what would bring my mother-in-law any peace or happiness on this difficult day (I feel I should have some kind of idea since my husband and I have lost two children but a wedding anniversary is completely different, and I am at a loss), any advice would be greatly appreciated. It’s wonderful and appropriate that you want to acknowledge the day for her. I’m on a work deadline right now but will write out some thoughts and suggestions and post them later tonight. Shellie, in case you didn’t see it yet, I posted a (kind of lengthy) reply in Wedding Anniversary and Grief. Today is the 2nd Wedding Anniversary after my husbands death. Would have been 13 years. I have a new boyfriend but I am still consumed with thoughts of my husband today. Trying not to be sad, but to feel the love and hope I feel from him everyday. I KNOW he wants me to be happy, and I’m taking it one day at a time. But days like today take an hour at a time. Just wanted to say it out loud, without talking to people I know about it. I don’t want it to be a “woe is me” thing. I’m here to stay. And although I thought I would spend the rest of my life with him, I realized he spent the rest of his with me. It’s natural to feel more deeply on significant dates like your anniversary. The first year, if you were at all like me, you probably had a bit of shock still clinging to you when your anniversary arrived. This second year that protective shock is likely gone. You are stronger by now, too, and I’m so happy for you that you are in a new relationship! But that doesn’t negate the love you’ve held for thirteen years … especially on the anniversary of your marriage. Your last sentence is profound: his memory and your life together will always be a part of who you are. My mom lost her husband (my dad) 8 years ago, I never say anything around their wedding anniversary or his death anniversary because I believe it’s easier to just move on and not acknowledge something that doesn’t exist anymore. We were talking and she mentioned that the 10th (of September) would have been their 40th, which is when I searched to see if you’re supposed to say something and found your blog, because again, I just ‘ignore’ it, for lack of a better term. I actually thought saying something would make it worse and trudge up all the emotions she’s had to work so hard to fight through all the years. Now I know and I’ll do my best to be better about it. Does this count for their old Birthdays too?? I’m sorry for the loss of your father eight years ago. It’s thoughtful for you to consider what will be most helpful to your mother. Everyone grieves differently, but most of the widows and widowers I’ve spoken with feel acute loneliness on their wedding anniversaries. Unless she tells you otherwise, I believe your mother will appreciate acknowledgment of the occasion — it helps to know it’s not forgotten altogether. My husband passed away 7 years ago and this year would have been our 50th anniversary. I would like a dinner with children and grandchildren, Is this a proper thing? Gayle, I’m sorry for the loss of your husband after so many years together. Your idea sounds like a lovely way to commemorate your 50th anniversary. If you’d like to gather your family together, please do! I’m so sorry to learn of your mum’s recent passing. I’m sure this is a tender time for all your family. it’s commendable that even in your own sorrow you are reaching out for ways to help your dad. Reblogged this on Loss, Grief, Bereavement and Life Transitions Resource Library. My pleasure. Delighted to have found you through Sue. Death anniversaries and widowed wedding anniversaries have a lot in common. One of the best ways to help grieving friends through is by letting them know you’re aware of their pain. Thank you for you insight. We lost my mom at the young age of 59 from a mix of renal disease & Alzheimers. The latter made our decision not to put her through dialysis when she didn’t know what was going on any more. My parents 40th anniversary is this September, only 2 1/2 months or so after her death. I have been looking for ways to help my dad through their first wedding anniversary after her passing. Today he said was the worst day so far since her death on July 1st. He has been playing so light hearted & that he is ok but i know he is broken because my parents love is the picture of how love should be. Through the good & bad. Your article is giving me some ideas on how to help him. Thank you. Cathi, I’m sorry about the loss of your mother. With the cruelty of Alzheimer’s, you’ve no doubt had to say goodbye to her in many little ways at a time. Even so, it’s understandable that the new, raw grief of her passing is difficult. Bless you for seeking ways to help your father while you’re also grieving. Thank you for your kind feedback. I wish you and your dad as much peace as possible through these early, painful months as you begin to process your grief and support one another. Thank you so much for your post. We lost our son suddenly at 37 and even though I had gone through the pain I still had trouble reaching out to others who were grieving their losses. By reading your posts I now have the courage to comfort others. Bless you. Louise, I’m so sorry to learn of your son’s death. I can’t imagine how difficult that must continue to be for you. Bless you for your desire to comfort others despite your own pain. This is a wonderful topic. Thank you for the article. This coming Saturday will be my parent’s first anniversary since my father died. This would have been their 45th anniversary. I know my mom has to be feeling pain even though she is good at putting on a strong face. I’m trying to figure out a way to honor my mother as well as honor my father’s memory. Your article really helps. Thank you very much. I’m grateful to learn this is helpful, Ben, but I’m sorry to learn of your father’s death. I hope you and your mother can draw closer as you honor their long union while missing him together. why do people celebrate a wedding anniversary after death of spouse? I give cheers on birthdays but do not celebrate wedding anniversary. Some of my family members do a celebration of life party/gathering on the date that they died..
That’s a great question, Jennifer. Some widowed partners choose not to celebrate the date of their wedding anniversary after their spouses’ deaths — and that’s okay. Whether they feel their marriage ended with the parting of death as you mentioned or the date is too painful to acknowledge in the absence of the late spouse shouldn’t matter to anyone else. What grieving friends should know is that it’s the bereaved spouse who has the right to decide how to commemorate the date — or not. Whether a person ignores, celebrates, hibernates (my personal preference so far), or otherwise commemorates a wedding anniversary after the death of a spouse is up to each widow or widower. They have the right to do as they see fit, and wise family and friends will support them in their choices. Not sure if you still read/reply to this blog, but I have a question. We lost my MIL to cancer 2 September 2017. FIL was dating a new woman by December and is now in a committed relationship with her. My DH (and, truthfully I am not either) is not ready to accept her in his father’s life. FIL has become a completely different person, from completely devastated and erecting a shrine to his wife of 35 years in the front yard to giving his 3 kids an ultimatum that Easter was going to be the last family celebration without his new girlfriend. He refuses to come see his granddaughter without her and we are not ready to introduce a new woman to our DD. My MIL stated her biggest fear was that her granddaughters would forget her – how is introducing a new woman so soon honoring and acknowledging that fear? I know grief has no timeline, people can move on when they feel it is right, but in that same respect, no one can tell us we should be ready to accept this woman in FIL’s life. My question is, tomorrow would have been their 36th anniversary. How do I celebrate this with my DH? We are not on speaking terms with FIL after he chastised us for not celebrating Mother’s Day at his house (with her present) and said the woman had bought flowers for their Mom’s grave out of the kindness of her heart, like she was better than us. We honored her in our own way, without the awkwardness of this other woman. He has moved on, but I don’t think my husband will for a very long time, and that’s okay. Help! Katie, this sounds like such a painful situation. I’m sorry for the loss of your mother-in-law and the current distress over your father-in-law’s strained relationship. Family dynamics can be tough enough without grief, but everyone’s unique mourning makes it more so. That last part of what I suggested might be hard, and it might be a stretch, and I’m not saying you have to add it. But in the long run, you’ll never regret showing more kindness toward your father-in-law and his new woman-friend than you might feel. I know this isn’t the same situation, but I had a slightly similar situation with my grandfather. Not long after my grandma died, Grandpa remarried — quickly. None of us in the family understood. Suddenly, his phone calls, letters, and trips were about and to his new wife’s large, extended family. Few of us saw him. When my mother died, Grandpa and his new wife happened to be traveling near our end of the country (to see her grandkids), so they made a brief side trip to attend the funeral. After the service, they visited with us for a couple of hours and then resumed their “real” trip (to see more of her grandkids) without telling us they were leaving. I’m ashamed to admit how deeply I resented her. Things remained strained with my grandpa after that — but he was still my grandpa. I never felt close to his new wife (after meeting her only for those few hours circa my mom’s funeral), but I had to decide whether I could treat her with civility and courtesy out of respect for and to keep a relationship with my grandpa. And I wanted my kids to continue to know and love him as their great-grandpa. Because we’d kept in touch (as much as his wife had allowed), we were able to resume more of the relationship we’d had before, and I’m SO grateful for that bonus time we had before he died. I still miss him. After my husband died, I better understood my grandpa and his decision to remarry so soon after my grandma died. Not long after a spouse dies, when the first outer layers of shock and grief begin to peel away, the raw wounds of loneliness beneath are everywhere. Everywhere. After sharing your life with someone for so long, suddenly having that half of you ripped away leaves you with an invisible, gaping wound, an insatiable longing for companionship — emotional and physical — as strong as the need to drink water or breathe air. (Not every new widow or widower acts on it, of course, but many do — more than I could have imagined before networking with thousands of other widows and widowers.) I’d tried to understand my grandpa’s need to remarry so soon, but until I became a widow I’d had no clue. My grandpa needed not to be alone. You and your husband don’t have to like your father-in-law’s new companion, and you don’t have to agree with his decisions. But in the long run, if you can continue to show him your love and treat her at least with the civility you’d offer if your father-in-law had introduced her as a new buddy or business partner (though I realize it’s far from the same! ), you won’t regret any kindness you can offer. It might feel like you’re being disloyal to your mother-in-law, but it’s not. You will also have the opportunity to continue to honor your mother-in-law’s memory by continuing to show love and kindness to her husband. And you can continue to tell your daughter stories about her and honor her in your own ways as you already have. I hope you and your family will be able to feel love and appreciation and peace as you commemorate his parents’ anniversary in a way that feels right to you. Please be gentle with yourselves as you continue to mourn your mother-in-law’s absence. If you still read this, i was wondering if you could help. My dad died 5 months ago at 52 and next week will have been their 20th anniversary. My mum has asked for the day off work as she believes she’ll just “stay in and cry”. Should I buy her a card and take her out for dinner? Would it be better to bring food to her house and just be with her? I’m sorry to hear of your father’s recent death. This must be hard for you as well. I applaud your compassionate concern for your mother. Since everyone grieves differently, there’s not a single right answer, but it sounds like you’ve got a thoughtful plan in place. Definitely buy or write your mother a card, and offer to take her out for dinner. She might be up to it and welcome a change of scenery. She might not. Or, she might think she wants to go out to dinner but change her mind at the last minute and prefer to stay in. Let her know you’re there for her either way. Please keep in mind that for some folks, gathering with other loved ones at such tender times is helpful. Some prefer to pass such days alone, so if your mother refuses your offers of company, please try not to take it personally. Assume it comes from her way of grieving, and check with her the day of not to persuade her otherwise but to let her know your offer stands in case she changes her mind. I hope this is helpful. It’s difficult navigating family members’ grief along with your own. I Lost my dad 8 months ago. Mom and dad were married 38 years. Tomorrow is their anniversary and i have no idea what to do. I am still in pain, but my moms pain is different. I left everything behind to be with my mom after dad passed. I was living in another country and left everything behind to be with her in these horrible time. We do talk about dad, and we cry together and support each other, but i do have the job to be the strongest one. should i take my mom somewhere? like not stay at home? or like ask her if she wants to do something? i want to acknowledge the date but dont want to make it more painful that it already is. Sara, I’m sorry to hear of your father’s death. You are so kind and wise to acknowledge that your pain and your mother’s is different, yet you share the grief over one you both love. But her wedding anniversary with your father was unique to them. It sounds as if you are already offer your mother tremendous support and you’ve sacrificed much to do so. Bless you for that. For your parents’ anniversary, don’t be afraid to ask your mother if she’d like to go out and do something with you. She might jump at the chance to do something that reminds her of their time together, or she might want to do something completely different to pull herself momentarily from that grief, or she might want to do nothing at all. She might even feel one way tonight but differently tomorrow morning and still differently later in the day. Sometimes when special anniversary dates loom so early in grieving, it can be overwhelming to think of what one might want to do. Consider offering her a few options of the kinds of things you think she might enjoy. For some folks, working on a jigsaw puzzle together or taking a walk through a park might be ideal. Others might want to visit a favorite or an untried restaurant. Some wish to visit the grave or look through photo albums. You know your mother best, and your loving concern and interest will help her. I wish you and your mother peace as you work through your grieving together. Thank you so much for replying. Sometimes it is hard to find answers or even talk to someone because they might not know what to say given the fact that they havent experienced the loss. I will ask mom if she wants to do something. She has been doing pretty well. Me being here has helped her so much and i couldn’t imagine leaving her. She only had dad, no relatives and she is not that much of a many-friends person. This painful experience has given me another point of view on life and family. Anyway, thank you so much for replying! You’re very welcome. Thank you for your compassion to your mother despite your own grieving! 2) the chances of her not thinking of her anniversary on that date is pretty much 0%. My friend who lost her husband said on their anniversary her daughter’s always take her out to eat. I would love to do this but I dont live nearby my sister and niece. I’m sorry to learn of the loss of your brother-in-law. I believe you’re correct that your sister will be aware of her anniversary date, and having your acknowledgment will reassure her that you’re aware of its significance as well as her loss. Bless you for your kindness, Kate!